Welcome to Week Four of Three Line Tales. Come and join our growing writing community. Use the hashtag #3LineTales on Twitter , #3LineTales on Ello or #3LineTales on Instagram if you’d rather not use your blog or don’t have one. Great to hear! I’m trying to choose photos that offer many different details for people to base their lines on. Love your lines! You’ve chosen very well so far – not an easy task, really. The New Yorker used to be my dream. I don’t think it is anymore. I mean, I wouldn’t say no, but all I want is to write and be read, have a book out with my name on and make a bit of money from it. I’m sure you will be, Sonya – you’ve got the talent for it, defninitely. Sounds like my dream too 🙂 If I could make some money from writing, it would feel like justification for all the hours I’ve spent on it! I’ll never be a ‘literary’ author – I’m not incisive enough, not smart enough with my words. And I like a plot to move! I’d love to be a good genre writer – that’s my aim, one day. Pingback: Three Line Tales – Week 4 – Dutch goes the Photo! “I took a rather dark approach,” she said. “Strange as the photo presented such positive possibilities. I mean a rainbow . . . ” she mused, shaking her head. 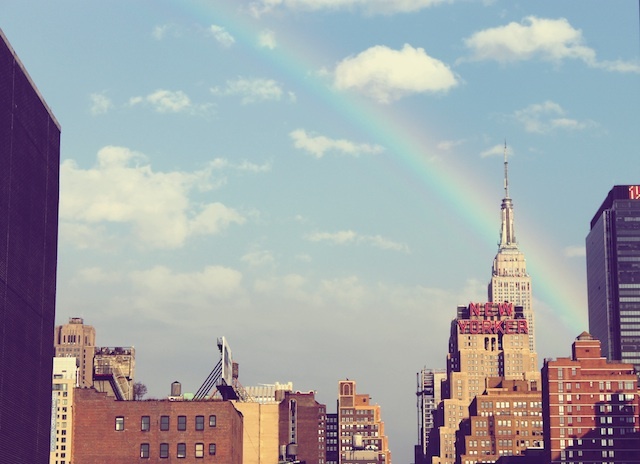 The city, to take its turn, launched a rainbow. God smiled for the change. I used to live there. I miss it. I want to go back. Good to hear – fun is top of the list TLT’s supposed to be :). Thanks for joining in! Sorry this is so late. I’ve been unable to do much this week. No worries, and you’re not that late. I have to get the round-up up on Sunday morning, though, or I’ll never get it done. Adding another link is no biggie.